You are here: Home › Does The World Stand Still For You?. . . If memory serves me, the one thing I learned from what I have been told is that no one thinks like I do. Trust me, it was never a compliment from the time I was a child. When I first started this blog in 2011, I started with this poem. I excerpt. had eyes to see it. This morning I was at the kitchen window looking at the orange tree and thinking creatures are eating the oranges by gouging large chunks and eating them still on the branch. 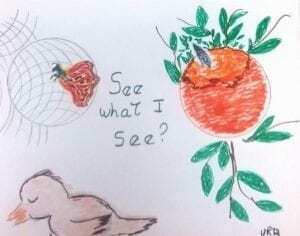 And I saw then a tiny bird sitting on an orange and pecking into the gouge and having his morning juice. He was barely seen in the leaves. But certainly too little to break the tough peel of the orange? A minute later he flew off. I gave my thank you for this sight. Just as I thought my Maudie Dove blinked but was uncertain, the next morning I watched her and sent my question out and sitting on her nest, she blinked. Several times. I had been told after I noticed that when I acknowledged the bird song one morning that the song halted momentarily, that indeed the thought was accepted and appreciated because the song begun again. This connection to my Earth is one that I cherish. It will be in my memory bank forever. We are unique in our perspectives and each step in our evolution puts us ever closer to what our potential is. There is no ultimate, there is only growth. I excerpt another poem called ‘The Moment The Star Fell’ which shows the ongoing quest for answers that have fueled my life. The question could be anyone’s question and it matters not, but the journey does. This was a Given and you will see your thinking in it. hope a star will fall, just for you. You think you will know then. only his world is truth. And you will doubt. required at that moment the star fell’. . . .
3 Responses to Does The World Stand Still For You?. . . Moments of certainty, followed by confirmation, erased by the doubt I force upon myself. Story of my entire life. I allow myself no peace. When the comment was that I could not even clap in time with everyone, a teacher pointed out I was already 1 and 1/2 beats ahead! Doubt began to fade then and I was not always at fault. Suzanne, forming the question, you already know the answer also. Upperfloor has the smartest readers! That teacher was one in a million, Veronica. She gave you such a gift. Bless her heart!